The picture above was taken in January 2005. Reckon you can jump like that? Read on. We've got a bit of a favour to ask. 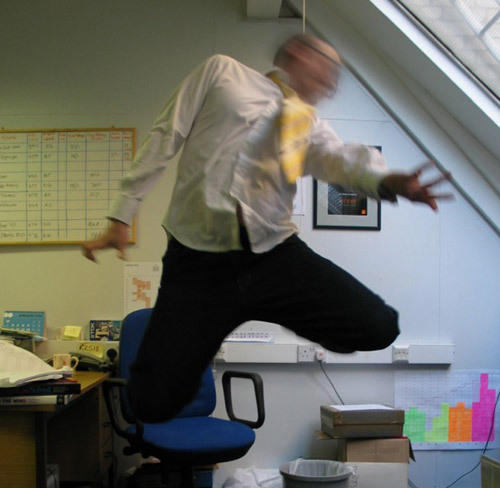 We need some people to turn up to our office on Friday morning and jump around a bit. There will be a trampete and there will be a video camera. We can't pay you I'm afraid, but we will reward you with a case of beer and some lunch. We need you to be there at 11am and you might have to wait around for an hour or so. A little bit of jumping in front of the camera and you're done. You have to look cooler and more athletic than I do in that picture. Interested? Email me ben at thedesignconspiracy dot com. That rules me out then.